Chakra Removal is the process of gathering the existing energies of each of the 7 major chakras in ones’ body, as well as, multiple minor/sub-chakras, and then moving them into their core star one by one. The process works in conjunction with the removal of the kundalini system which restricts even more energy flow that stops you from achieving higher vibrational frequencies. The core star is the energy center that holds all of your energy and once your chakras have been merged into your core star, your energetic system will be activated and energized, completely unrestricted and will allow you to naturally connect your entire being with no separations or compartments, your energy will flow from source freely. There is much controversy that is going on about the question of whether or not chakra removal is something that should be done, or that it can be done at all. The truth is, we have all been led to believe that the chakra system is something that we can not live without. However, we can live without them and I myself am living proof that we can. Since having my chakras and kundalini removed, I have noticed a tremendous difference in my meditations. They are easier to connect in and at a much faster rate and I can immediately feel my core star energizing and expanding. Not only that, but I feel amazing. I don’t have to check my chakras or balance them anymore and anyone I come in contact with, no matter what the situation is, their energies don’t affect me in any way. Furthermore, I have noticed a dramatic increase in my abilities to transmit healing and am beginning to see increased psychic abilities as a result as well. We Need This Chakra System – Or Do We? So why make us think that the chakra system is vital for the health of our bodies and energetic system? The reason why is the chakra system is actually a program that has been brought forth by ET’s long ago to us to make us believe that we need our chakras to live and function. This is a belief system modification. It is a specialized program that wires your entire being a specific way to make you believe that chakras are good for you. These are some of the statements you will hear from others who are completely against it. Though, they do not fully understand the magnitude of the situation at hand. The chakras are astral implants that have been designed as a limitation-based programming/belief system structure that limits the flow of energy from your core star. They regulate energies in various parts of your body in the center of your body from the base of your spine to the top of your head. When the chakras are out of balance, they begin to shutdown and fully close. When this happens, diseases can manifest that are emotional, physical and behavioral related. Until the chakra is opened and balanced, the person will continue to feel the way they feel and begin to worsen in their condition as more chakras shutdown creating other negatively influenced problems. How could it possibly be that it is all a lie? No body wants you to know that the chakras are essentially negative implants that can be used against you to siphon your energy and create illnesses that wreak havoc on every aspect of your life. They are used to drain and contaminate your energy. If you really stop and think about what the chakras do to limit you, you will learn very quickly that having your chakras removed is an essential piece in the ascension puzzle. Are The Chakras Really Removed? Probably the most controversial question, yes? When a chakra is removed, the energy is gathered up until the energy has been fully gathered. It is then moved to the core star. I know the word removal to some would sound wrong because they don’t believe it is possible. Instead of thinking of it as a removal, think of it as a merging. Or a “Chakra Unification”. As I’ve explained the process above, the energies of the chakra are gathered up and moved into the core star. The energies of each chakra are still there. They haven’t been removed and sent back to the ether. They are just now in one location and this releases the restrictions from your energetic body because you are dissolving the chakra system and merging it as one central source. The Three Star System is an automated system that gets activated once the core star has been activated and energized and is not usually talked about as much as the core star itself as being the one single energy source once the chakras are merged. In reality, there are three main sources of energetic centers consisting of the mind, core and loin stars that automatically keeps your energy fields charged. Because the chakra system formally worked with each gland within the endocrine system in the body, these three stars take the place of the chakra system and gives each gland and body part the required amount of input, data and energy it needs to keep your energy system working without compartmentalizing all of your higher self and source energies. The Mental/Intellectual Aspect – operates from the head where the Mind Star resides. The mental aspect interfaces with all the brain and mind functions and helps integrate left and right brain so that neither is dominant and they work in synergism with each other. You can see how this is supported when you look at the picture at the bottom and understand how the spiritual body moves the energy from left to right & right to left as it rotates. The Emotional/Intuitive Aspect – is in the middle where the Core Star or “soul” resides. This aspect if functioning properly is the master “center” and is bigger than the other two. It’s job is to manage not just itself, the Heart/Soul and it’s Emotions/Intuition, but it has the innate intelligence and wisdom to initiate and continue the interfacing of all three aspects and keep them in good working order. The Creative/Sexual Aspect – is at the bottom where the Loin Star sits. This aspect is extremely important, way more than the obvious, “sexuality” …as without creative energy, we would wither and become extinct, both as a body and a species. Creativity is how we get ourselves out of messes and is the catalyst for growth and evolution. The energy from this Loin Star-creative aspect is what can help us rebuild after devastation both inside and outside the body. It is also what ignites passion and when combined with the energies of the Core Star-emotional/intuitive center/aspect and the head-mental aspect there are no limits to what we can create, re-create and regenerate! By removing the chakras and kundalini, the energy is allowed to flow as it would naturally as directed and required by your higher self. After the chakras and kundalini system are removed, your core star remains but is now unified and fully open. It is our direct connection to source and our higher self. To some, this may look like one large chakra, which resides near the Solar Plexus near where the old heart chakra was. Keep in mind that this may not be for you. You may not resonate with it and that is perfectly ok. Trust in your higher self. The best way to know if it’s something that you are meant to do is to receive guidance from your higher self. After all, your higher self knows everything about you and everything that is good and bad for you. The more chakras you have, the more limits that have been put upon you. There are practices out there that suggest the activation of higher amounts of chakras as you begin to raise your frequency even higher. Does this really make sense? We raise our vibration and gain more chakras that limit the flow of energies in and around our bodies. For what purpose? Have you really stopped to think about this? If chakras aren’t a limitation-based program, why do we receive more as we move into a higher vibrational frequency? The answer is, it is a program. A program that has been designed to train you to believe that you need all of these chakras and that in order for you to obtain spiritual enlightenment, you must clear and activate all of these chakras to reach that state. Remember, we are in a game. This is all an illusion. We are playing the game according to our higher self and the path that we are meant to follow. If chakra and kundalini removal resonates with you, the benefits to going through this removal process is truly amazing! – Ability to receive and express much greater energy from our spirit or higher self. – Ability to handle and experience higher frequencies. – Feelings of being more centered, calm, secure, powerful, peaceful, and self contained. – Psychic abilities begin to unfold and develop more rapidly. – Removal of limitations imposed by the chakras. – No need to put time, money, or effort into clearing blockages from or balancing your chakras. – No more crown chakra induced headaches. – Your spirit is unlimited. The limitation has been in the etheric and astral structures and programming within our energy body including thought forms, etheric wiring, implants, chakras, devices, parasites, and other structures. – Chakras limit the amount of energy coming in from our core star and our energy fields. – Chakras separate the energy of our core star, which makes it easier for others to attach cords and drain our energy. – The chakras were implanted so that specific energies could be accessed, thereby allowing control and manipulation of our energy fields. – The chakras may act as blockages of energy that can cause physical deterioration of the body and psychological illnesses. – Chakras keep our body’s energy field segmented, making it easier to manipulate from an external source. This is a useful step in removing our limitations and manifesting our I AM presence. Once your chakras are removed, it is permanent. Your body will go through clearings and activations as your body is getting used to your new energetic body. ** This is a free-will planet, if one so chooses to bring their chakras back into their body, they may do so with heavy intent. They will eventually come back and provide the same limitations as before. This session will be performed during a pre-arranged time as it is required if you wish to feel the different things that will be taking place in your body. You will need to be laying down to have your chakras and kundalini removed. Please know that I will not perform the session unless we are able to set up a pre-arranged time to do the session. This means we both must be online and you must be in comfortable clothing with nothing in your pockets and nothing around your neck or on your fingers. This session requires you to be laying on your back with your eyes closed for 1 hour. You may see visions or purple swirls and you may also experience hot or cold tingling sensations followed by vibrations in specific areas of your body as the energies of the chakras are gathered up one by one and moved into your core star location. This may cause you to feel pain as there are many times where entities are attached to your chakras and as a result you will physically feel them being detached from a specific area of your body where that chakra is located. You may also feel even more energy pulsing through and circulating much more than it ever has before. This is because there are no more energetic blockages to restrict the flow of energy. Know that I am always here with any questions you may have. Basic is the Chakra & Kundalini Removal Session. This session gathers up all of your chakras one by one in a specific order and and are merged into your core star. This session will allow deeper connection to your higher self and source energies. 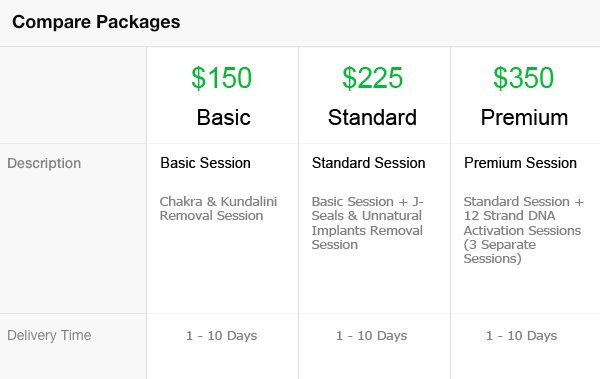 Standard is the Chakra & Kundalini Removal Session and J-Seals & Unnatural Implants Removal Session. This session is the process of removing all of your chakras and kundalini system and remove all of the various energetic blockages. This is a total of 2 separate sessions separated by 7 days each. Premium is the Chakra & Kundalini Removal Session, J-Seals & Unnatural Implants Removal Session and 12 Strand DNA Activation. This session is the process of removing all of your chakras and kundalini system and is designed to remove all of the various energetic blockages and accelerate your DNA activation process. This is a total of 5 sessions each spread out by 7 days. Thank You Jaye, for such a awesome session once again! A week ago, I did the Chakra & Kudalini Removal and the energies were amazing. Some mild in certain areas of the body and some more intense. You literally can feel the energy working thru each Chakra and the energies intensified (hot & cold feeling) mostly in my Heart and Crown Chakras. I wear reading glasses and always felt some pressure in my eyes no matter how often I had my eyes examined. During the session I instantly felt the pressure lifted. In addition, my mind feels mindless, like I really dont have any mind chatters racing in my thoughts every 17 seconds anymore. My mind is really only in the Now. So Awesome! My mind has more space for better things now! Also, I realize things that use to bother or offend me don’t anymore. My reaction is much more calmer. Which is awesome! The feeling of calmness, happiness and love fills me all day! I have always been a sensitive empath it’s been hard not to take on others energy, even if I really don’t want to. NOW thanks to Jaye, I don’t take on anyone else’s energy; I don’t get tired anymore in big crowds or at work from other people. I can finally retain my own energy! Also the removing of attachments from certain previous energy points has really allowed me to be more open to who I am- without restrictions. I feel so happy all the time and deeply peaceful, really in tune with my own energy. I feel like I’m not carrying around as much weight or gunky dirt anymore! Now that the attachments are gone from my old chakras! Jaye, thank you for your wonderful service. He is super fast at responding and explaining the processes of the chakra and kundalini removal. The process involved a lot of movements from all angles of the body. He warns me that it would be painful, so I took some aspirins to numb the pain. I felt the difference as soon as it was done. The edginess I used to feel was gone and I felt free. I want to do more things in life and I am not limited to it anymore. The side effect was my brain wasn’t able to process information as quickly a few days after the event. Also, a slight healing was taken around my heart (but that’s from the activation of the chakras). Those symptoms are now gone. It’s worth having this done, if your an empathy. This session was amazing! At first I notice pain in different chakras. And in the middle of the session I twitch and the time feel strange like the time line change… After the session I feel great just amazing 😀. Now my meditation is so much deeper and my inside is always calm and silent. Thank you Jaye! You are a fantastic healer and a great teacher, I’m learning so much from you… I’m very grateful that our paths crossed! I can’t recommend this session enough. I didn’t feel much during this session. After the session though, I felt like I was no longer in my head. My mind went quiet, and all the mind-chatter was gone. For a few days, I also felt a bit slow and somewhat apathetic. It all went away though after a while. And now I feel more centered, and I don’t feel affected by others’ energy. If you’re an empath, you’ll love this session. You will no longer be bothered by energy vampires, complainers and negative nancies who unconsciously try to dump their emotional stuff on you and feed off your energy. After the session I feel more centered and peaceful. It’s easier to be in the present and not to overthink things. There’s so much stillness. Even that one person who used to really tick me off (on purpose) can no longer get to me and get a rise out of me. And that’s pretty empowering and amazing!! Chakra Removal; I like calling it the chakra unification as it is pulling all the energy back into the core star. I was introduced to this as a possibility 3 yrs ago, and now, my Divine said do it! I pulled many websites and could not leave Jaye’s. The removal process itself had a few tugs and pulls. All while embraced in a golden room of light with many of my Guides and Spirit Beings assisting and in witness. Actually the room was packed. My HS directed 28 days before another session as I am already in a deep transformation. I had a number of headaches, and first time I realized I was not doing the instructed meditation. Once I included this into my everyday meditations, the energy integrated, the pineal expanded and the core star connected, activation occurred. Very powerful, gentle and loving. Thank you Jaye for your commitment to excellence. Much Love!